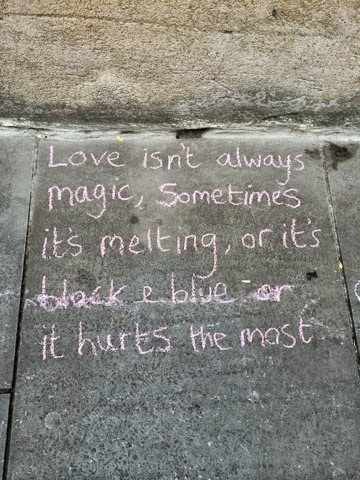 As I walked the streets of Canterbury last weekend, I observed two youngsters writing in chalk on the walkway little bits of poetry, haiku, quotes and phrases all along the street. I really appreciate such creativity...a really unique way of expression. Very few people stopped to read these bits of words shared, and most just ignored it and walked on. It is really a pity that many these days forget to appreciate and enjoy the simple things or 'stop to smell the roses' in life. I read everything that was in my path and even snapped a few with my iPhone. "Love isn't always magic"....I guess this is true in reality ...but I am too much of a romantic at heart to want to believe it and this can be really tragic at times. Avocado, Banana and Cucumber Salad.